Master Hypnotist, Marge Perry, invites you to schedule your free hypnosis screening. Your free hypnosis screening is fun, informative and takes about 30 minutes. Fees, policies and procedures are explained. We answer any question you may have. Your hypnosis screening gives us the opportunity to meet one another, discuss your desired result and how best to achieve it. We will evaluate your ability to be hypnotized and recommend a hypnosis program that fits your lifestyle and budget. 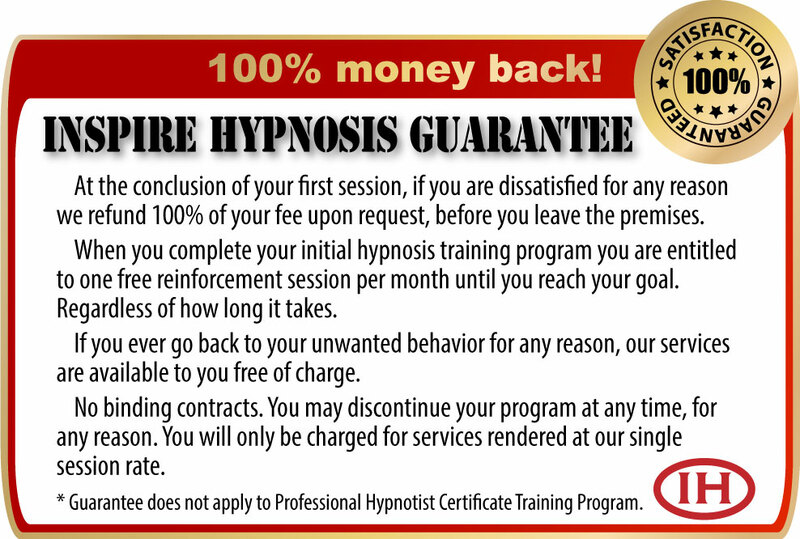 If we feel hypnosis will not benefit you, we tell you so. No hard sell, pressure or arm twisting. Inspire Hypnosis' free screening is for information only. The purpose of our free hypnosis screening is to make sure you have all the information necessary to make an informed, intelligent decision whether hypnosis is right for you.